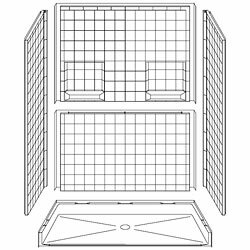 Bestbath® five piece 60" x 30" barrier free shower unit with 4" smooth tile finish and beveled 3/4" threshold provides easy walk-in or roll-in shower access. The strong, luxurious polyester gelcoat composite fiberglass shower with diamond tile accent finish is built with full plywood backing on all walls for outstanding strength and customized installation of accessories. The self-supporting pre-leveled bottom eliminates mud setting. Easy, snap-in-place installation from the front. No grout cleaning and easy care finish. Manufactured in USA.